Whether you are a hand tool purist, a power tool junkie or somewhere in between, odds are that you spend most of your time at your workbench than any other place on your shop. Its worthwhile investing in a properly built workbench that is equipped with what you need to last a lifetime of woodworking. This workbench is practical and functional. A rock solid base to provide strength and stability. A heavy duty laminated wood top to accommodate front and tail vises. A tool well and drawer to keep tools nearby. 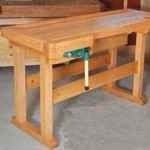 Full Service Workbench Woodworking Plan Part 1. Lift Up Router and Benchtop Tool Table Woodworking Plan Part 2.